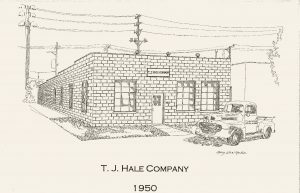 TJ Hale was founded in 1950 by 53-year-old Thomas J. Hale Sr. The original location, a 3,000 sq. ft. shop, was on N. 125th Street in Butler, Wisconsin. At the time, the company specialized in supermarket interiors and architectural woodworking. Tom Hale, Sr. handled all the drawings, bidding, and expediting. His wife, Dorothy, did the bookkeeping. Their sons, Tom Jr., and Jack worked in the shop sweeping floors and helping on weekends and during school vacations. In 1960, as business volume increased, they built a 10,000 sq. ft. building at 12833 W. Glendale Avenue in Butler. Jack and Tom Jr. joined the company in 1969. In the mid-1970s, TJ Hale began manufacturing fixtures for department stores in addition to supermarket work. Sales volume steadily increased. Jack assumed the responsibility of President in 1977. Thomas Hale Sr. passed away the following year. In 2008, Jack Hale retired but remains a member of the advisory board. The name has not changed – nor has the quality of our product. Now servicing retail, hospitality, restaurants, business interiors, architectural millwork and other industries throughout the United States and across the globe. In order to meet the expectations of making our clients look good, TJ Hale has developed facilities to support fabrication of wood, metal, acrylic, and other composite materials. Today’s TJ Hale is housed in a 120,000 sq ft integrated manufacturing facility. Further supporting production capabilities, TJ Hale developed a 100,000 sq ft distribution center which allows us the ability to consolidate and ship completed product direct to our client’s final destination for immediate installation. We have taken this a step further and replicated these processes by establishing global partners in Asia and Europe to reinforce our capability to manufacture and install on client sites around the world. Here is the official video from the “2018 shop! Night of Honor” inducting Jack Hale into the association’s Hall of Fame. Congratulations, Jack, and thank you for your contribution to TJ Hale’s success and your influence on our culture. We have grown under your mentor-ship and value your kindness and friendship.